We examine subjective contrast and edge sharpness discrimination in the presence of different amounts of coma, astigmatism, and combinations of these two aberrations. We also examine the correlation between subjective results and objective image quality measures. These include the integral of the modulation transfer function (MTF) across the frequency range of interest (MTFa), the Strehl ratio, the variance of the wave-front aberration, and the radius of 84% encircled energy of the point-spread function (R84). For the target orientation that is most affected by the aberrations, we find that the MTFa and R84 give good correlation, while the Strehl ratio and the variance do not. In addition, we find that the MTFa correlates with subjective results for all target orientations. 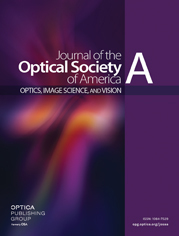 We discuss the implications of the results on the automated assessment of the image quality of visual instruments. a R84 is measured in millimeters on the screen.